What happens if a child picks up a stick in the forest? It's not a question of if, because they do and they will! When a child does pick one up, what does that stick become? Working with school teachers, this is one of the first concerns of being outside with a classroom of curious children. Do we let them play with sticks? And what does it look, feel, and sound like if 20 children are wielding sticks in the forest? Laying down a rule of "no picking up sticks" is like taking your students to the top of a fresh snowy hill with sleds scattered about and telling them they can't go sledding. What would the point be? 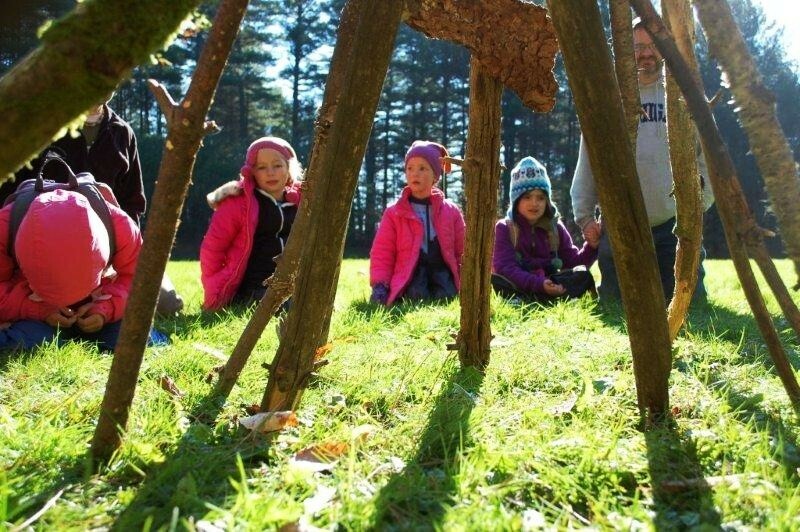 Here is where we break down the barrier of "no sticks" and begin to observe and experience the benefits of allowing children to physically, socially, and emotionally construct their world through stick play. First, what if we asked the children what they thought? So, we did. 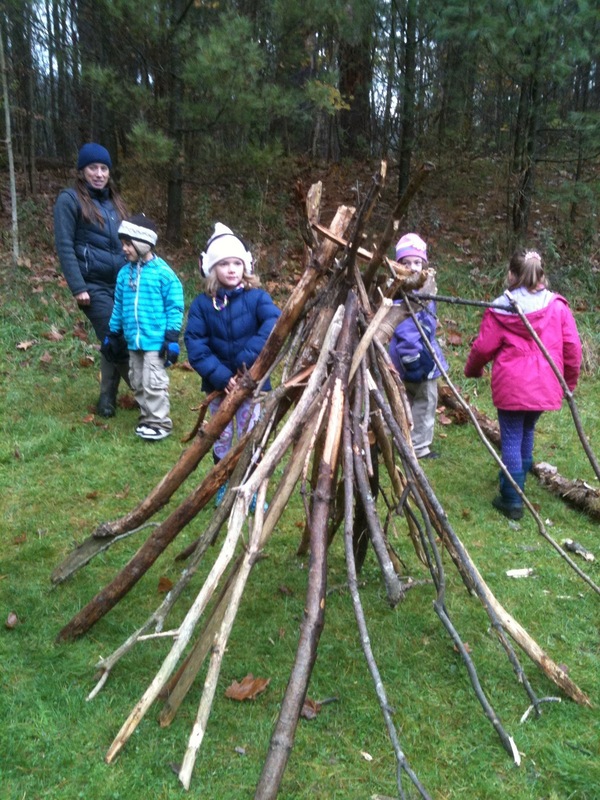 In morning meeting we asked students "How would you use sticks in the forest?" The children's reaction was immediate. Hands were raised and bodies were wriggling with ideas and prior knowledge. Wow. That's a lot of ideas! Notice the use of the word build. Children building things with objects found in their immediate environment is as natural as them learning to walk. Providing space and time to build outdoors expands the experience into a new realm. With more space, it allows for more movement, which creates more language use, and in the end, deeper cognitive development. The next question we pose to the class is, "How will we do all that building and be safe near our friends?" I ask the children to raise a hand if they have ever been hurt by a stick before. All the children's hands go up. They have all had direct experience with this! The children share with a neighbor and the stories begin to pour out. (Children LOVE and need to share their personal stories. Especially when it connects to the topic at hand. Giving them a chance to share with other classmates strengthens the classroom learning culture and is powerfully inclusive) After a couple minutes of sharing we begin to make our Safe with Sticks list. In all 10 classrooms, the children agreed that sticks are not weapons and we don't hit with sticks. I never had to prompt these two ideas and it was always the first or second rule created by the children! Inevitably, a child grabs the perfectly styled stick and points it at a friend. "Bang! I got you!" With a simple reminder we're redirected and back to our work.
" Hey friends, remember, we are in a Peace Zone. 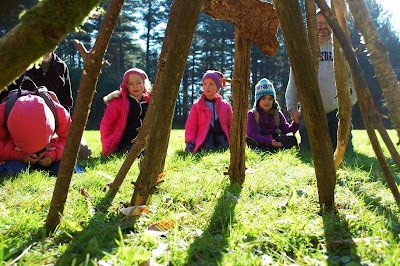 Let's keep working on that awesome shelter you started building last week!" It has become such regular part of the routine that I know hear children reminding each other of our rules. They are now in charge of their learning and their creations. I hear children using phrases such as "bubble space" and "safety circle" when moving a stick bigger than themselves. I am also witnessing balance, coordination, development of gross motor skills, and cooperation as three children move a very large branch to add to a debris hut. Our Safe with Sticks rules are made and students are imagining what they can do with sticks. 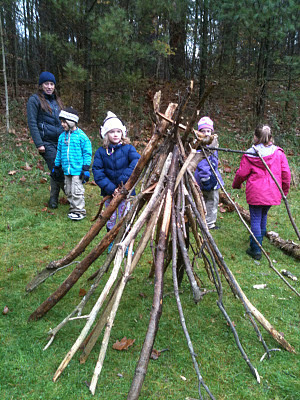 Now the possibilities grow as the children navigate the landscape of the forest with building plans in mind. With a supportive adult to child ratio and room to roam, here are some examples of what has happened! Using a saw to cut the perfect length! The outcomes of all this stick building? Here are just a few,.....developing spatial awareness, decision making, strengthening social and physical skills, building positive interaction and communication skills, learning problem solving strategies, appreciating what your body can do, and for some children it gives them an opportunity to develop control over their behavior and improve concentration by moving, manipulating, and orchestrating objects they have found in nature. What if a child picks up a stick in the forest? I guess I would be more concerned if they didn't. Thanks for your response! It's nice to know kids in Alaksa love sticks too! I am contiuosly amazed at childrens creations with sticks. Just today we made mini sleds in the forest and children added large broken sticks to add weight to their sleds. Nothing a little duct tape won't help along! I now have 10 teachers comfortable with their clasrooms using sticks in all kinds of learning scenarios. Send along some pictures if you can. I'll share them with my students!